I loved it -- and to my mind -- it fits admirably an immediate need in our season's lists, -- the need for a richly patterned story spun out of another layer of that peculiar underworld with which Steinbeck is at his best. Once again, as in Tortilla Flat, he makes no effort to stress "social significance". To be sure, one can strain at his underlying meanings and say that such people should not exist in today's plenty -- but no one can argue that they wouldn't exist again tomorrow if eliminated today. Flotsam and jetsam of humanity, -- the gang of boys who could get jobs but didn't except when emergency demanded -- and then quit when the emergency passed. Lee's felicitous acquiescence to their thinly veiled urging that they become caretakers of his newly acquired shack; their neighbors in the deserted lot; Doc, high mogul of the marine laboratory, doctor to the neighborhood on occasion, beloved by all; and the others who made up the dregs of Cannery Row. The story builds up to first one and then another climax, as the boys plan a party for Doc. There's humor -- and pathos -- and sheer good story telling as the incidents unfold. The plot is tenuous, held together by the characters. 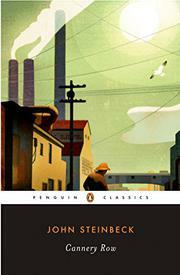 But Steinbeck succeeds in making them human, likable, out of drawing but never in caricature. And one feels that to him, too, they are part of the flavor of a folk legend of today.